Canon Rebel T3 12.2 Megapixel CMOS Image Sensor and Canon DIGIC 4 Image Processor. Canon’s amazing 63-zone, Dual-layer metering for accurate exposures and features Canon’s Basic+ function, HD video recording and Live View shooting, plus a convenient in-camera Feature Guide.Canon EF-S 18-55mm f/3.5-5.6 IS II SLR Lens: a new kit lens that provides excellent performance. A lightweight construction makes it easy to carry, and Canon’s acclaimed optical Image Stabilization also minimises the risk of blur, allowing photographers to use shutter speeds 4 stops slower while still maintaining a blur-free shot. The EF-S 18-55mm f/3.5-5.6 IS II succeeds the existing EF-S 18-55mm f/3.5-5.6 IS in Canon’s lens line-up.Canon EF 75-300mm f/4-5.6 III Telephoto Zoom Lens: An economical DC motor driven AF zoom, with the same optical system, construction, and exterior as its USM sister model. Wide Angle .45x Fisheye Lens enhances your panoramic photos. 2x Telephoto Lens doubles the power of your zoom up to 600mm. 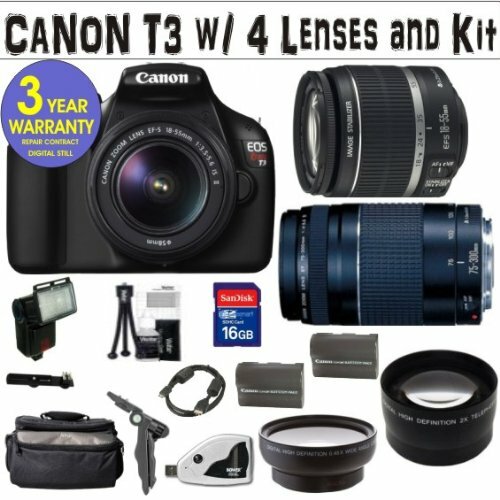 16GB Deluxe Accessory Kit 16GB High Speed Memory Card, High Speed USB Card Reader, Vivitar Camera Holster Case, Orginal Supplied Canon Battery, Rechargeable Lithium-ion Replacement Battery Pack, 2 in 1 Table Pod and Steady Pod, Vivitar Bounce Zoom Slave Flash & HDMI Standard Cable.